You told Labor what you thought! During the last half of April 2007 almost 900 of you wrote to Labor, prior to its National Policy Conference 2007 (27-29 April) at the Darling Harbour Convention Centre. This page shows what you wrote to the ALP. 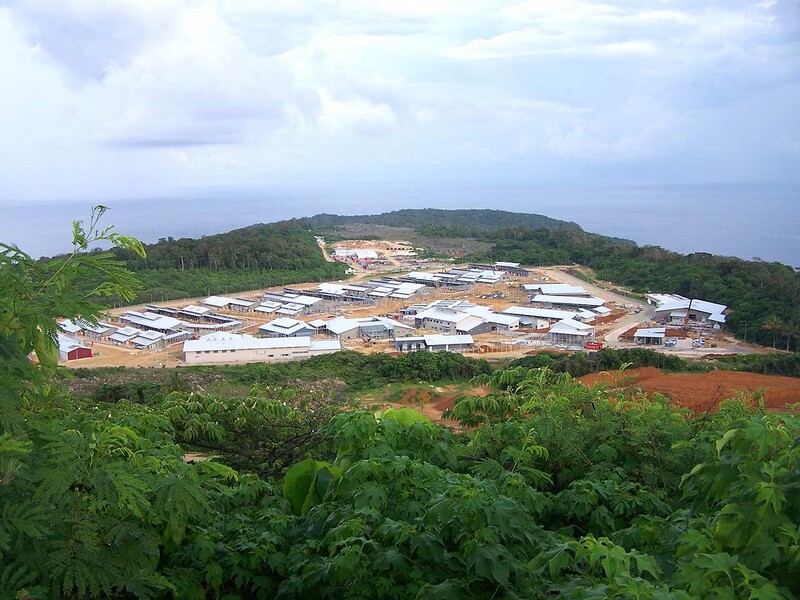 Our letter campaign was linked to our report about the Christmas Island detention centre. We called it our "Alcatraz Down Under". The ALP, if it wins government, gives the impression with its asylum seeker policies, that it wants to discontinue the ghastly practices in place during 'the Howard years', practices and policies that have damaged thousands of lives of those who sought our protection from persecution. 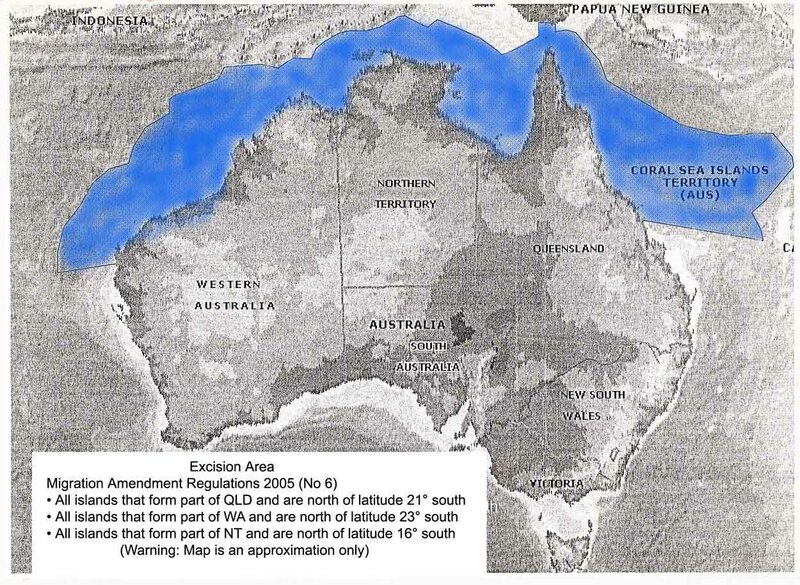 While this is to be applauded in general terms, Labor wants to maintain Australia's excision zone (see the Excision Zone map here), and it endorses the Christmas Island detention centre for those arriving in this exclusion zone by boat. Labor, by policy design, intends to short-change those attempting to reach Australia by boat, by withholding their human rights, access to full health and legal services, and by policy design Labor is fine about undermining the UN Refugee Convention for asylum seekers arriving unannounced by boat. In the weeks leading up to the ALP National Policy Conference in Sydney, almost 900 visitors to our website wrote a letter to ALP Parliamentary leader Kevin Rudd and Immigration Shadow Minister Tony Burke. Their letter showed the standard text as re-printed below, and included personal paragraphs and comments - see a selection of these comments here. Dear Mr Kevin Rudd (1): A future Rudd government should not undermine any International Conventions, but instead create a different and new Australia, becoming a shining example of human rights and justice in accordance to these Conventions, first of all for our neighbouring countries in the Asia-Pacific, then for the rest of the world community. By supporting Mr Howard's shocking maximum security prisons for innocent people, especially in the Detention Centre on Christmas Island, and locking up legitimate asylum seekers who seek our protection from persecution, using their International right to do so, your government would be in extremely serious breach of the UN Refugee Convention and several other Conventions. Your government would also deny basic human rights for those most vulnerable, for example by reducing access to health and legal services. Dear Mr Kevin Rudd (2): The notion that it would be 'illegal' to come to Australia to seek protection is a farcical notion, cruelly created by John Howard and peddled in Australia by MP's of his government. In this context the 'Excision Zone' is an internationally reprehensible law, because Australia, in signing the UN Refugee Convention, has promised to keep its borders open to unannounced asylum seekers, also those arriving by boat. Therefore an ethical Rudd government cannot possibly uphold this 'Excision Zone', because we should not stop or deter those seeking out our country to seek protection, also not those who use boats. This space was reserved for additional comments to Kevin Rudd. You can read a selection here. Dear Tony Burke MP (1): I applaud and endorse your efforts to bring to the ALP Conference a motion that Labor should dump forever the cruel concept of Temporary Protection Visas. Refugees, once approved, should be able to get on with their lives without any restrictions. Since 2000, officers of the Immigration Department were found to be wrong in their primary refugee assessment between 60% and 80% of the time when they claimed Iraqis and Afghanis were not refugees, and 100% of the time when they claimed a large number of Vietnamese were not refugees. In this context, no asylum seeker's full judicial right to appeal against decisions should ever be curtailed or withheld or undermined by political decisionmakers. Dear Tony Burke MP (2): Labor's asylum seeker policy should be defined at a level of such superior calibre, that never again reports will have to be written that condemn Australia's treatment of asylum seekers and refugees. No reports should ever need to be written again by the United Nations High Commissioner for Refugees, Human Rights Watch, Amnesty International or the Human Rights and Equal Opportunity Commission. Your policy of allowing people to be locked away on Christmas Island, away from the media, human rights advocates and independent lawyers and migration agents does not give me enough confidence that the horror period of the Howard years comes to an end if Labor wins government. Halfway improvements are just not good enough! All asylum seekers should be processed on the mainland. They have done nothing illegal by coming here and by coming in boats, or by coming through 'third countries' or by using people smugglers. Your intention to take them to Christmas Island is plainly wrong! This space was reserved for additional comments to Tony Burke. You can read a selection here. 26 August 2006: Dreaming of a straight-shooting and principled ALP - "...imagine a room in Parliament House in Canberra. Imagine the Federal Labor leader ... flanked by ... Mr António Guterres, the United Nations High Commissioner for Refugees. The occasion is the launch of Labor's new and definitive Human Rights and Refugee Policy for the 2007 Federal election." 10 December 2006 - Mission accomplished: Labor's back with a Rudder that works - We can be confident that the ALP's troubles have melted into thin air with the appointment of "the dream team", and especially the fact that Kevin Rudd is its leader. From Rudd's theology follows a vision of social responsibility in action - an vision that will eventually also spell an inevitable end to mandatory detention. 28 April 2007: What you told Kevin Rudd and Tony Burke - "We decided who will come in to this country and the circumstances in which they arrive when we signed and ratified the Refugee Convention..." This page lists a selection of comments to ALP Opposition leader Kevin Rudd and Labor's Immigration spokesman Tony Burke MP in the Project SafeCom online letter campaign during April 2007.
:::UPDATED::: 10 April 2007: Alcatraz Down Under - The monstrosity is nearly complete... - Like a gigantic scar cutting through the pristine wilderness, the Christmas Island detention centre blights not just the hillside of the island, but also the Australian psyche. Don't believe the pollsters showing the ALP way ahead of the Coalition. John Howard is heading for another victory, and Kevin Rudd and the ALP are once again walking toward the abyss -- doing a 'Latham' by snatching defeat from the jaws of victory at virtually the same stage of the electoral cycle. It is almost too painful to watch. Take the Hicks issue. The day before David Hicks's appearance before the Pentagon Commission (let's call a spade a spade) in Guantánamo Bay, all Rudd said, timidly, was that Hicks was not going to get a fair trial and that, if he were Prime Minister, Rudd would ensure that every Australian would have their rights protected. It was a weak and disappointing turnaround from Rudd, who had previously savaged the Pentagon process with the contempt it deserves. But at least he put himself out there. Then came the moment last week when Hicks, in appalling conditions and under the pressure of five years of abominable incarceration, pleaded 'guilty' to one charge of 'materially supporting terrorism.' Nobody believed that he entered into a plea bargain -- subject as it is to an astonishing and unheard of gagging order -- as a free man. In fact, it looks increasingly likely that Hicks pleaded guilty because he couldn't take Guantánamo Bay any more -- otherwise, he would have plea-bargained a long time ago. And what did Rudd have to say? And what did his Shadow Attorney-General Joe Ludwig have to say about it? The ALP, pathetically, requested a 'briefing' about the Hicks case from the Government. What did they expect to get from such a 'briefing'? Images of Hicks agreeing to a guilty plea at gunpoint with the Star and Stripes in the background? An admission by Howard that he had refused to lift a finger to uphold an Australian's human rights? Against such a background, surely it was time for moral leadership from the PM-in-waiting. We waited and waited for words from the man who promised us he'd be an alternative, not an echo. Remember, Kevin? That was the best line you used to persuade your colleagues to elect you and ditch Kim. And what did we get from you in a week where the rights of all Australians, by implication, were imperiled by our Government's complicity with the Guantánamo Bay version of 'justice'? In a week where Human Rights was the issue, where most Australians felt indignant about the treatment of one of our own, all you did was to beat your chest in Parliament reciting motherhood statements about the environment ... Brilliant politics, Kevin. I don't know who's sold you this magnificent electoral strategy. But here's one piece of free advice: get rid of them, fast. And it's not just the Hicks issue. Take Howard's 'Pacific Solution.' The Government is now discussing recruiting Indonesia to help in the 'processing' of potential asylum seekers. Like the Nauru option, this would violate international conventions signed by Australia. We all know that. As a matter of fact, Australia doesn't even have a refugee problem to start with. The number of potentially 'illegal' refugees who have attempted to enter Australia over the past 15 years is less than 20,000. It is a miniscule non-issue. The so-called refugee 'crisis' is a fabrication concocted by the Government to build electoral support among the most misinformed segments of our population. We all know that. The ALP should know that. So violating Australia's international obligations while treating the most defenseless people on earth with calculated cruelty, was only objectionable because it cost too much. What did he have to say about the morality and ethics of the Howard Government's stance on refugees, and the erection of detention centres in the most desolate places on earth where innocent people, including women and children, would be confined potentially for years? And what did Rudd say about these moral issues? Same as his spokesman: Nothing. I am sorry, but conceding the ethical battle to your adversary is a defeatist attitude which will take the ALP nowhere. It is also wrong. Beazley and Latham tried it before and it did not work. It was a disaster. Don't the ALP learn from history? Shying away from today's key ethical and moral issues is not a recipe for electoral victory. Ultimately, Howard, right or wrong, has always had the fortitude of going for what he believes even if that may disgust many. Howard is a leader who is not afraid of being 'wedged' himself. That is why the mob keeps voting for him -- a lesson that the ALP seems to have lost sight of, despite four consecutive election defeats. And, Kevin, if the mob don't find a reason to vote for you, if they end up perceiving that you don't have what it takes in the issues that count, once they get over your good manners, charm, and easy smile, come November, Kevin, you will find yourself with simply ... nothing. Ezequiel Trumper is no relation to the great cricketer Victor Trumper. He is just an Australian Wog who also passes for a corporate lawyer with over 20 years' experience working for some of Australia's largest companies and law firms. He is a broadcaster on Radio Austral (in Spanish) and on Radio 2SM (in English). He was born in Argentina, and is a dual New Zealand and Australian citizen. To make things more confusing for everybody, he is also Jewish. A refugee advocate has blasted Labor's cautious stance on asylum-seeker issues in the lead-up to the federal election. Jack Smit, who heads Project SafeCom, said the opposition had been frozen with panic about the prospect of a political debate on boat people during an election year. He urged Opposition Leader Kevin Rudd to stand up for asylum seekers' rights, following reports Australia is considering expanding its controversial offshore processing regime to encompass Indonesia. The plan comes as 83 Sri Lankan boat people, intercepted en route to Christmas Island in February, have their asylum claims processed on Nauru. Mr Smit said Prime Minister John Howard was once again politicising the issue of refugee arrivals - reviving memories of the 2001 "Tampa" election campaign. "With the coming of Kevin Andrews (to the immigration portfolio), Howard clearly wants to set the agenda back to 2001," he said. "He's sniffing out where Labor goes." But Mr Rudd and Opposition immigration spokesman Tony Burke did not want to discuss the topic, he said, for fear of being politically "wedged". "Labor is very scared that (Mr Howard) would make this into a new Tampa. Labor is too scared to declare that John Howard is an underminer of international conventions," Mr Smit said. "They've failed to claim refugees, human rights and international conventions back for their own platform."